Houston Texas is loaded with lots of top rated courses and here is our list of the best Houston golf courses. This list is based on our unbiased golf course reviews and ratings of all the Houston golf courses (public, private, and resort golf courses) we have played over the last several years. 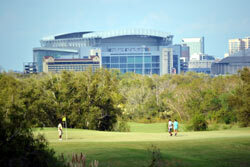 The Houston Golf Map will help you find these golf courses, as well as all of the other Houston Golf Courses. Speaking of the best golf courses in Houston, you might also take a look at the Best Public Courses in Texas, Best Private Courses in Texas, Best Resort Courses in Texas, and the Best of the Best in Texas.